There is a reason why Valiant is the most read comics company in the business right now, and this title is a shining example of why. Valiant has had home run hits with each title that’s hit the shelves so far. The Summer of Valiant, including Blooshot, X-O Manowar, Archer and Armstrong, and Harbinger, followed closely by Shadowman and the ever loveable Quantam and Woody. Now we’re brought to Eternal Warrior. Hot off the heels of supporting role in Archer and Armstrong, Gilad finally gets his own title. How does it fair? Let’s find out. Take in the new comic scent as we give you an advance review of Eternal Warrior #1! We start in ancient Mesopotamia, where Gilad is ready to lead is people into a skirmish that is most certainly suicidal. His wizards concecrate he and others for this battle, his son Mitu among them. As the wizards of the Earth go from one to the other, a young woman is discovered amongst their ranks! It’s Gilad’s daughter, Xaran, and with some rather harsh persuasion, she is forced to stay behind with the other women and children while the men, her father and brother among them, go off to fight to what can only be a glorious death. A fight it most certainly is, as the warriors of Earth clash steel to flesh against human beasts that feel no pain, and only have blood and death on their minds. You can only imagine what happens next. Greg Pak is a master storyteller, what with his work on Batman, Superman, and Planet Hulk. Pak’s story here is glorious. You don’t need to be versed in the events that took place in Archer and Armstrong, though after reading this, it may feel like that. Let that feeling go. Pak takes us on a journey of the Eternal Warrior, and it’s a tough and bloody road to follow. The issue pulls us through loss, sacrifice, hatred, betrayal… we get it all, and there’s no break in between. From the moment Xaran comes to the rescue of her father and brother, to learning the difference between being human, and being a beast, Greg Pak’s story is filled with strength and heart. It’s rather amazing to see the transitions and history he puts into this story, leaving us so hungry for more. It most certainly will be worth the wait for the next issue, and obvious arc for this story. Glorious, indeed. Let’s not forget the amazing visuals by Trevor Hairsine. Every panel in this issue is tight. I don’t mean that in the slang sense of the word… Well, I do, but by tight, I mean his lines. When you open this book, just take a minute to bask in Trevor’s work. It’s astounding how detail-oriented he is, and how well he puts so much together. From the battles between the warriors of Earth and the beasts who worship blood and death, down to the lonely cabin Gilad shares with his dog many centuries later, Trevor’s pencils are honestly some of the best in the business right now. Can that be argued? Sure, but one look at this work here puts forth a strong sense for my opinion. Not so long ago, I did a review on the original release of Eternal Warrior, back in the ’90’s, when a very different Valiant took the industry by storm. Unlike my feelings on some of the older Valiant titles, Eternal Warrior stuck with me. I was invested in the characters. I was enticed by the story, I wanted more out of Gilad. I wasn’t disappointed there, and here, with Valiant as it is now, I’m even more impressed by what they’re doing. They’ve kept consistent, strong stories with very solid artwork coming every month. Though not all issues can be a solid 10, I think they’re pretty damn close. No title that has come out has stunk, fallen short, or just not held up to the hype, and here, I firmly believe Valiant hits it out of the park yet again with the team that is Greg Pak and Trevor Hairsine. If you’ve never taken the time to read Valiant as it is now, or are still on the fence after all this time, now is your chance to get right into what everyone else is enjoying so much. 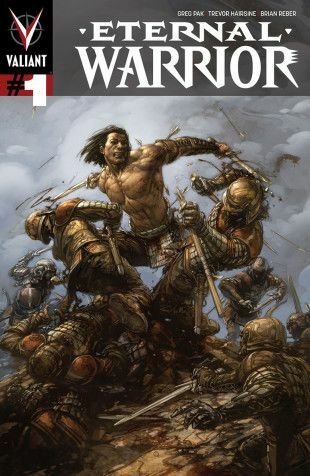 With a powerful story and extremely pleasing artwork, Eternal Warrior #1 is another shining gem from Valiant. With the Summer of Valiant 2.0 coming to a close, we can only expect more of the same from here: Solid storytelling and amazing artwork that delivers on every possible level of enjoyment. What better way to spend your hard earned comic money than on something awesome and worthwhile? Start here, my friends. Parental Concern: Lots of blood and death, so the kiddies might want to stick to something a little less gross. I definitely agree. This was a great first issue and it sets up some big stuff for the coming arc. Valiant basically can do no wrong right now! Just added this to my pull list. I love Pak and Eternal Warrior is something I read a bit of in the old Valiant. Glad you enjoyed it can’t wait for it to arrive in my pull list!